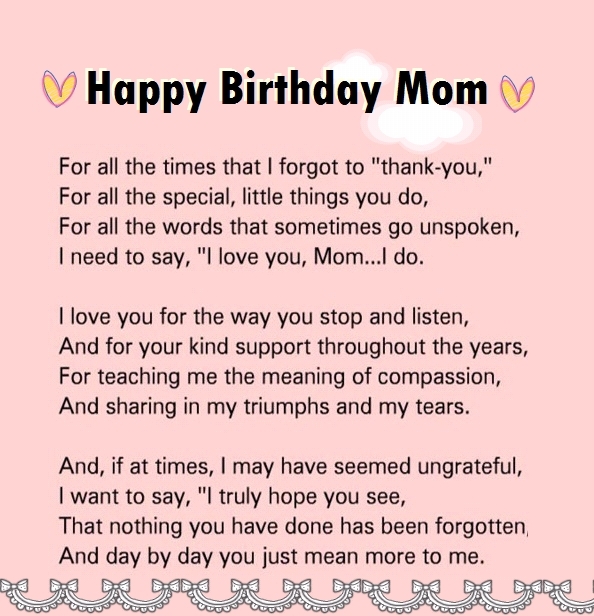 There are so many sweet things to do and to say to your mom on her birthday, but writing a sweet happy birthday letter could really bring love, tears in her eyes, this is the best way a son could adopt to show his love for his mother. As a son I have so much love for all the motherless sons and daughters in the outer world! Every son in this world comes with a different and unique story about his parents, especially about his mother. I have no regret to admit I am an ordinary son, but yes, I got an extraordinary woman as my mother. She is the first step of every motivation for my every success, for my every joy, for my every dream that comes true. It is my mom's birthday today as we celebrate the mothers in our life. I am forever ‪thankful for the mother that God gave me. Happy birthday mommy! I love you and Thank you is not enough to express what and who you are to me. I am also thankful to God that He allowed such an example of a mother as you in my life for so many years. This is a sample happy birthday mom letter from a far living son; you could add or edit it according to your own personal story. Happy birthday letter to mom on her birthday! Today is your birthday and this is a day about you, but we know motherhood is 24 hours, 365, and a life-time! Motherhood is about joy, pain, sacrifice, and glory. In my 27 years of life, you have blessed me with an eternity of love, lessons, and example I can never repaid with money, time, or material things. But I would like to say thank you for some things. Thank you for playing two roles! You raised me and my sisters on your own, never being negative toward our fathers or bad-mouthing them. Never placing them on child-support or anything like that. They were always welcome to see us and reach out to you. You understood the joy of parenthood. And knew it was their lost in not seeing us grow up. Thank you for showing me "WHAT STRONG IS". In my younger years, I watch you beat cancer. I witness you bounce back from losing a home & people coming into your life and doing you wrong. THROUGH IT ALL! You are in better health then most, more financially secure then many, and better today than yesterday. Through your fight and commitment, you made it clear to me, "Shawn, no matter the trail, hardship, or downfall. You can have better days if you fight!" What you go through now is nothing, and you made life easier for me, by allowing me to watch you go through the fire and come out glowing with joy! Once again happy birthday my sweet mom, you always there for me, you always have my back. I love you with everything in me. Thank you for being an amazing Mother. Thank you for making so many sacrifices, help me to become the man I'm today. Thank you for your strength, never giving up on me, your love, your sacrifice, your example, your legacy. Thank you for being the best mom for me, grandmother for my daughter, and aunt for your nieces and nephews. Happy birthday to a woman who isn't just my mother, but she's a mother to most when they need. Many know of my mother but not who she is. This woman would put clothes on your back and food in your stomach, to a lot of you she already has. I just want to be thankful for a great mother and great human being. She wants nothing but the best for me and I want nothing but the best for her. We don't always see eye to eye but regardless the case she raised me to be ah king and would forever be my queen I appreciate everything she done for me in my life and would never forget it. ‎My mother ‪is ‎my queen. Happy birthday to my lovely mother!